1. Peel and devein the shrimp, discarding the heads and tails. 2. Heat the coconutcream in a large saucepan or wok over medium heat, add the curry paste and cook, stirring constantly, until fragrant, about 5 mins. 3. Add the shrimp and coconut milk, and bring genty to a boil. Simmer over heat for about 10 mins or until shrimp are just cooked. 4. Season to taste with fish sauce and palm sugar. 5. 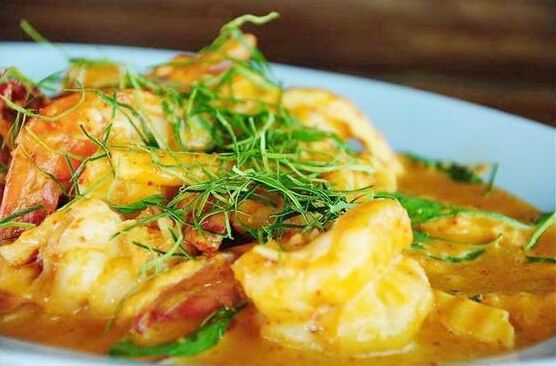 Place shrimp on a serving platter garnished with shreds of kaffir lime leaves, basil and chilies.